[168 Pages Report] The V2X market is valued at USD 22.60 Billion in 2016 and is projected to grow at a CAGR of 17.61% during the forecast period, to reach USD 99.55 Billion by 2025. The base year considered for the study is 2016 and the forecast period is 2017–2025. Factors such as rising demand for real-time traffic and incident alerts for increasing public safety, increase in government funds for better traffic management, and the development of connected vehicles are driving the growth of the V2X market. The research methodology used in the report involves primary and secondary sources. Secondary sources include associations such as International Organization of Motor Vehicle Manufacturers (OICA), Emission Controls Manufacturers Association (ECMA), European Automobile Manufacturers Association (ACEA), Environmental Protection Agency (EPA), and International Council on Clean Transportation (ICCT) and paid databases and directories such as Factiva and Bloomberg. In the primary research stage, experts from related industries, manufacturers, and suppliers have been interviewed to understand the present situation and future trends in the V2X market. The V2X market size, in terms of volume (thousand units) and value (USD million), has been derived from forecasting techniques based on vehicle production and penetration of various V2X technologies. The figure below illustrates the break-up of the profile of industry experts who participated in primary discussions. The V2X market ecosystem consists of manufacturers such as Continental (Germany), Qualcomm (US), NXP Semiconductors (Netherlands), Robert Bosch (Germany), and Delphi Automotive (UK). These companies develop new products, adopt expansion strategies, obtain supply contracts, establish joint ventures, and enter into agreements to gain traction in the V2X market for automotive. With the given market data, MarketsandMarkets offers customizations according to the company‘s specific needs. The following customization options are available for the report. 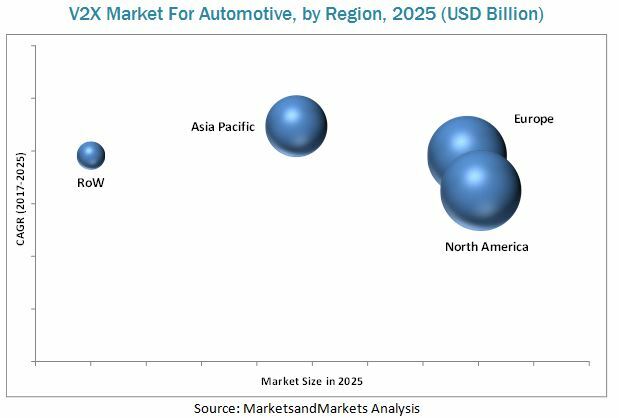 Analysis of industries in the automotive vehicle-to-everything market in different geographical regions. Customization can be provided on country-wise analysis of the automotive vehicle-to-everything market with respect to industries. The vehicle-to-everything communication is a revolutionary technology that can transform the automotive industry in the future. V2X is a wireless technology that enables communication between the vehicles, infrastructure, and other devices in the vicinity, grid, home, and network. This type of communication enables better traffic management, which leads to reduced congestion on the roads. High energy savings and improvements in location accuracy and positioning are some of the other advantages of this technology. The rapid technological advancement has paved the way for semi-autonomous and autonomous vehicles, which have a wide range of application for V2X communication technology. Furthermore, the wireless technology for vehicles is set to enhance the intelligent traffic system and is expected to help in the implementation of the technology. In addition, V2X wireless technology is expected to improve traffic congestion, thereby enhancing the active performance of the vehicles. The applications of the automotive V2X technology include intelligent traffic system, collision avoidance, parking management systems, emergency vehicle notification, and other sub-applications. This technology helps the vehicle to receive warnings regarding real-time traffic and alerts related to accidents or other hurdles. Several countries across the world such as the US, Germany, UK, and China are adopting the V2X technology for improved safety, operational performance, and environmental benefits. However, the implementation of V2X technology requires substantial funding from the government. In 2016, The US Department of Transportation's (DOT) National Highway Traffic Safety Administration (NHTSA) announced that it would take steps to enable vehicle-to-vehicle communication for light vehicles which would help improve safety. What would be the impact of government mandates on the V2X market? How do you see the demand of vehicle-to-everything in the Asia Pacific region? How would you see the improvement in road infrastructure impacting the vehicle-to-infrastructure market globally? How do you see the future of vehicle-to-pedestrian due to the increasing focus on consumer safety? The V2X market is projected to grow at a CAGR of 17.61% during the forecast period, to reach a market size of USD 99.55 Billion by 2025. The key factors driving the growth of the market include the rising demand for real-time traffic and incident alerts for increasing public safety, increase in government funds for better traffic management, and the development of connected vehicles. Software is estimated to be the leading segment of the V2X market, by offering type. Software helps to manage the content and configuration of the device as well as assists in policy and compliance management. The growing demand for access and control over the V2X system is expected to drive the software market. The V2C communication is estimated to hold the largest share, by value, of the V2X market. V2C communication is expected to play a pivotal role in connected and autonomous vehicle applications. Various systems and applications of such vehicles will be offered in the cloud from where they will control the entire operations of a vehicle. This widens the scope for the growth of the V2C segment. The automated driver assistance segment of the V2X market is expected to witness the highest growth during the forecast period. V2X communication offers features such as intersection collision warning, obstacle detection, lane change assistance, lane departure warning, rollover warning, road departure warning, forward collision warning, rear impact warning, and safety margin for assistance vehicles. The increasing demand for these features is driving the growth of the automotive V2X market in automated driver assistance. The electric vehicle segment is expected to witness the highest growth in the V2X market during the forecast period. In 2017, Toyota Prius is the only EV model that has vehicle-to-vehicle communication technology. The cars can communicate up to 300 m (nearly 1000 feet) in a 360-degree radius. North America is estimated to be the largest V2X market during the forecast period. The market growth in the region can be attributed to better infrastructure and high income, favorable policies and regulations by the government, and need for a better and effective transportation system. The European region is estimated to be the second largest V2X market for automotive during the forecast period. The increasing concerns about the safety of travelers and vehicles on the road have led to the adoption of V2X technology by the European Transport Safety Council (ETSC). The increasing demand for V2X systems with telematics applications is expected to drive the market in this region. However, lack of infrastructure and additional cost burden on consumers can hinder the growth of the V2X market. The V2X market is dominated by a few global players. Some of the key manufacturers operating in the market are Continental (Germany), Qualcomm (US), Delphi Automotive (UK), NXP Semiconductors (Netherlands), and Robert Bosch (Germany). It is a model that delivers a plethora of options such as weather updates, firmware & software updates, multimedia services, etc. over cloud (internet) inside a vehicle. These features are deployed in a vehicle to create a congenial atmosphere and help the vehicle user and passengers to stay connected with the outside environment. However, such features and applications need a constant update for proper functioning. To avoid any malware, such updates are provided with the help of cloud-based services. Furthermore, the growing demand of consumers for digitalization and growing complexity of connected vehicles will lead to a V2C. 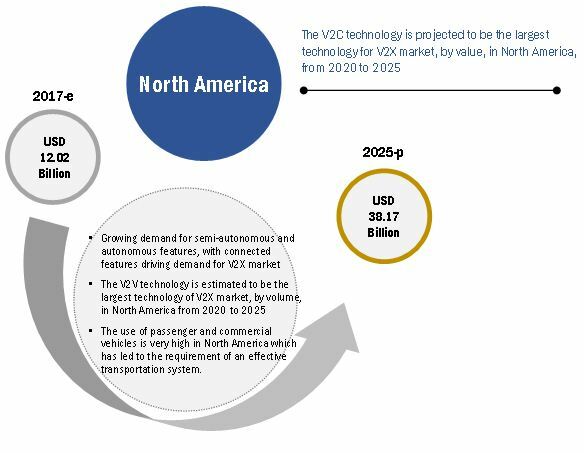 V2C technologies are expected to play a pivotal role in connected and autonomous vehicle applications. Various systems and applications of such vehicles will be offered in the cloud from where they will control the entire operations of a vehicle. Vehicle-to-pedestrian (V2P) communication involves detection of pedestrians on or near the roads. V2P detection system can be implemented in vehicles to provide warnings to drivers. In V2P communication, a pedestrian uses a warning system, which is a handheld device such as a smartphone or smart watch, which would enable information exchange between the pedestrian and vehicle. According to the US DOT, 4,884 pedestrians were killed and an estimated 65,000 were injured in traffic crashes in the United States in 2014. According to a 2016 report “Spotlight on Highway Safety” by Governors Highway Safety Association, there has been a 10% increase in the number of pedestrians killed in 2015 compared with 2014, which has led the US government to take steps to protect pedestrians on roads. The US Department of Transportation (DOT) has planned to test V2P technologies at the Turner Fairbank Highway Research Center (Virginia) intersection test bed for market readiness and real-world implementation. Vehicle-to-Grid (V2G) communication technology is the integration of an electric car into the public power grid. The integration of electric cars and the grid would lead to reduction in grid instability. The communication allows the grid to have the data on the energy available in the automobile and to calculate the time for next recharge, which can help solve the energy storage problem of grids. Asia Pacific includes China and Japan which is the two major countries in terms of EV sales, and hence it is an attractive market for V2G communication technology in Asia Pacific. The vehicle-to-infrastructure (V2I) connectivity is the wireless exchange of critical operational data between vehicles and the infrastructure, intended not only to mitigate vehicle crashes but also to enable a wide range of other safety, mobility, and environmental benefits. The V2I communication technology applies to all vehicle types and roads and transforms the infrastructure equipment into smart infrastructure through the incorporation of algorithms. These algorithms use data exchanged between vehicles and infrastructure elements to perform calculations that can recognize high-risk positions in advance and alert the drivers. Intelligent traffic system, parking management system, and fleet & asset management are some of the common applications of the V2I market. A significant advancement is the ability of traffic signal systems to communicate the signal phase and timing information to the vehicle. V2I communication would allow suggestions to be broadcasted to drivers through road displays, by means of wireless connections. Vehicle-to-Vehicle (V2V) communication is the wireless exchange of data among vehicles traveling in the same vicinity, which offers opportunities for significant safety improvements. The V2V connectivity approach is most suited for short-range vehicular networks. Emergency brake light warning, forward collision warning, intersection movement assist, blind spot and lane change warning, do-not-pass warning, and control loss warning are some of the common V2V communication functions. Government initiatives to fully commercialize V2V communication is expected to be the major factor driving the V2V market in North America. In 2014, National Highway Traffic Safety Administration (NHTSA) under the US DOT announced to take steps to enable V2V communication for light vehicles, which would help improve safety. In 2015, DOT announced that New York City, Wyoming, and Tampa would receive up to USD 42 million funding to pilot next-generation V2V and V2I communication technologies. Vehicle-to-Device (V2D) is a wireless communication between the automobile and a device that is used to access information on the status of the vehicle with direct configuration options (air conditioning, windows, and doors). V2D communication provides functions such as vehicle status including information on fuel status, oil level, and lamp check, internal and external temperature, evaluating routes, share audio, and compilation of vehicle data needed to file tax claims for commuting expenses. The V2D technology can also be used for locking or unlocking the vehicle remotely and for remote home automation functions such as lighting and garage opening. The V2D communication technology also enables the vehicle owner to communicate with the car charger at home to inform regarding the charge available in the vehicle and when the next charging would be required. Ford (US) and Amazon (US) are working on connecting a car to home, which enables the driver to access the home automation functions such as home lighting and garage door openers. Where will the government mandates take the industry in the mid to long term? Will the hardware module and software providers continue to explore new avenues for V2X market? Which geographical markets have lower penetration of vehicle-to-everything where there is a good growth potential? *Details on Business Overview, Products Offered, Recent Developments, SWOT Analysis & MnM View Might Not Be Captured in Case of Unlisted Companies.